Costalegre: Manzanillo's Santiago & Playa La Boquita - Beach! Costalegre: Manzanillo’s Santiago & Playa La Boquita – Beach Fun! A sea turtle drifts by. Mom enjoys a brilliant sail. Villas on Playa La Boquita in Santiago Bay. Black and brown patterned sand yields gold in bright sunlight. Looking out at the anchorage. Umbrellas line the shores of the estuary. A footbridge crossed to Las Palmas resort. Manicured lawns bring a special kind of serenity. A panga in the mangroves. 81 is the new 18. Mark talks "bike shop" with the locals. The Santiago Flea Market offers tourist souvenirs. Horseback riding on the beach. The Oasis gave me a perfect birthday moment. Late January, 2011 - We left Zihuatanejo and took our time returning north to Manzanillo. strained and groaned in too much discomfort to make it worthwhile. to-side roll that kept us rolling in our bunk all night. detective work in the wee hours of the night. the merest exhales once again, laughing silently as we curse yet another day of motoring. as they drifted past our hull. wide bay. 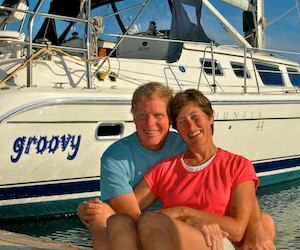 Manzanillo's expansive bay is perfect for daysailing, and we took full advantage. beautiful villas that belong to the huge gated community Club Santiago. looking out at the yachts swinging in the bay. chorus of librarians whispering "shhh." away from the boat if we weren't careful. he used to have a bike shop in his garage too. bargain clothing offerings to find more practical fare. never getting their hooves wet. long steel cargo ship that sank in a 1959 hurricane. remnants of the masts that stick up above the waves. out over the pounding surf.